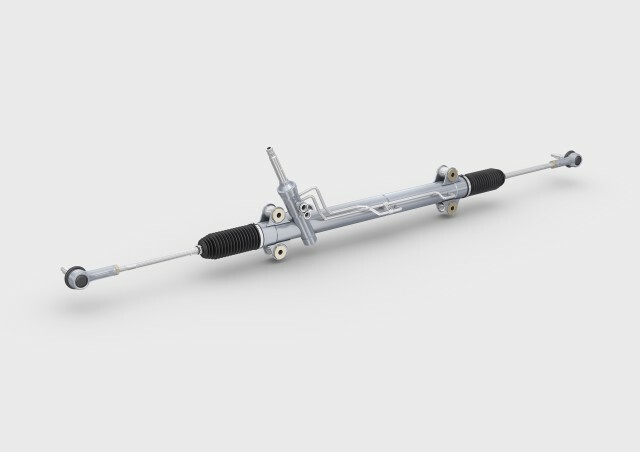 tedrive’s steering gears for hydraulic and electrohydraulic steering systems contribute towards optimizing the overall CO₂ balance of the vehicle. In the case of HPS and EHPS we make use of the installation of a steel housing, which enables the installation of a CO₂-saving high-pressure system. The sturdy steel design can withstand a bursting pressure of >400 bar. Owing to the thinner walls and the tight-fitting welded-on pipes, the system requires only a very small installation space and is not heavier than the conventional aluminium housings in spite of the use of steel. In addition, the steering precision is noticeably improved by the more rigid housing made of steel. The steering system can also be used as a supporting element of the front axle.